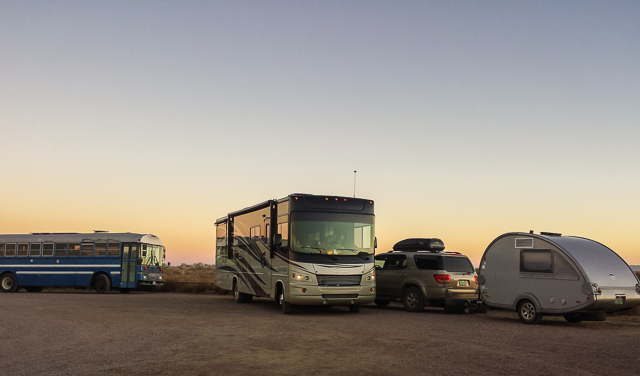 We continued to travel south, staying at another RV park without goatheads this time, north of Socorro. I wanted to see wintering Sandhill Cranes and other birds at Bosque del Apache, a National Wildlife Refuge in the Rio Grande valley. After setting up camp, we headed for the refuge and spent the afternoon in the visitors’ center and driving one of the auto tours. The dogs spent the whole time in the car so as not to disturb the wildlife. The weather was cold and windy, not the best for bird watching and photography but I made the best of it. What do you want for your birthday? I always hope to see something wonderful or have a wonderful time doing something I enjoy. Yesterday, the first day or Spring, was my birthday. The girls and I headed over to the Okanogan in hopes of finding enough bare, snow-free ground for a good hike. Well good luck with that. Winter continues to linger on most of the hills unless they are steep and south-facing. We did manage to do some rambling and scrambling but the rotten snow was a challenge for a good walk and the open hillsides that were snow-free are so badly damaged by intensive grazing and wildfire that there are few native plants and lots of weeds. Since the big fires of 2014 many fences have been built in hopes of keeping livestock out of the creeks and this is a good thing. However, I crossed, over and under, numerous strings of barbed wire during our little outing. Giving up on that, we headed across the Okanogan to the Timentwa Flats in search of Sandhill Cranes. But once again, winter’s grip is slow to let go and all the little lakes were frozen and the ground was snow-covered. I did see several Rough-legged Hawks and some Snow Buntings, both winter birds in our area, along with some vibrant Mountain Bluebirds and a pair of Killdeer walking on ice. It was a mixed bag. The road got progressively worse and I didn’t want to take a chance of getting caught in the mud so we turned around and gave up on that route. We headed down to the Big River and Washburn Island. I knew it was snow-free and warm. We were able to walk all the way around it. At one point a Red-tailed Hawk circled above, screeching at us. Maybe there is a nest nearby? We were surprised when a small group of Sandhill Cranes lifted from the unseen cattails behind a row of Russian olive trees and flew around us landing somewhere behind where we had already walked. Sky enjoyed jumping in the Columbia and at the end we observed a Great Horned Owl in a nest. All in all a pretty good birthday adventure and a beautiful day! A willow tree burned in the fire and sprouting vigorously. When your birthday is on the Vernal Equinox, the first day of Spring, you might have some expectations for the day. I got it in my head that I wanted to see sagebrush buttercups – one of the first wildflowers that shows up in our shrub-steppe habitats. Well never mind that here at our house, there is still over a foot of snow on the ground. Wet, rotten, sloppy snow. Spring birds like bluebirds, phoebes, juncos and others have arrived so it does sound like spring but right now as I type this, it is snowing. Again. I keep thinking I am done with winter but it’s clearly not done with me. So if I wanted to see buttercups, I was going to have go somewhere else. I went east and north to McLaughlin Canyon, near Tonasket. The day started out sunny but was soon overcast and breezy and fairly cold at 37° Fahrenheit. Good walking weather. There were a few patches of snow and there was lots of water everywhere. I imagine in the summer this place is very dry and full of rattlesnakes so this was a good time to visit. Melting snow sent cascades of water over the cliff faces and in the shady spots, the rocks and shrubs were covered with ice. Shortly after I arrived I heard the wonderful song of the Canyon Wren! Have you heard them? Listen here. I heard several others while I walked. The trail starts in a narrow section of the canyon and all that water found its way to the path so it was a bit of a struggle to keep my feet dry. I was somewhat dismayed by all the weeds. This area burned in 2015 when much of Okanogan County was on fire and its recovery is slow. I did see that some pine trees have been recently planted so hopefully they will grow quickly and hold the ground in place during spring flooding. I walked til I was overlooking the bottom of the canyon and the Okanogan River. Still no buttercups. The hill below me was steep and not appealing for walking but it did look warmer and dryer than the ground I’d been walking on. I used my binoculars to scan the hillside and sure enough, a good two hundred feet below me, I saw the bright yellow color of the buttercups. I found them. It was worth the climb down and back up. The dogs had great fun exploring a new place and so did I. We were all grateful to be walking on dirt again. Afterwards, we drove down valley and managed to find some Sandhill Cranes in the snow. It is the time of year when they migrate through this region but most years, the lakes and ponds are thawed and the ground is mostly snow-free. I imagine they are having trouble finding enough food to eat. And here at home today it is still snowing. Big, fat, fluffy flakes. Winter needs a new calendar. See that dark spot just above the pine cone in the lower right? That’s a spring. Fresh water coming out of the ground. Could you two help me here? Of several attempts, this was the best one. This is rock cress which has white flowers later in the spring. Right now it has a yellow fungus on it that usually doesn’t kill the plant. Oh yeah, the county road switches back up there. Someone dumped a load of household trash into the canyon. Sad. We left the Desert Museum and drove to Kartchner Caverns State Park, SE of Tucson. The caverns are still alive and and wet, growing new features that take 1000’s or millions of years to change. The state park gives very closely guided tours to the two different areas of the underground landmark but forbids visitors from taking anything into the caverns for fear of damage to the surface. If a visitor should accidentally touch something, it is marked with flagging and later someone comes along and cleans the surface with water from the cave. So no pictures are allowed. If you want to see what they look like and what we saw you will have to visit the place yourself or else see the website. It was quite lovely and I very much admire the original founders of the caverns for being such good stewards and protecting the place for future generations to see and learn from. After that we went in search of wintering Sandhill Cranes. I’d been told that the Wilcox area was good for cranes and it was on our way to the next planned destination. However when Judy, the expert navigator was studying her smart phone to figure out where to go, she read about Whitewater Draw. The information said it was the best place to see cranes so off we went. To get to Whitewater Draw we drove in the opposite direction – south, nearly to Mexico through some fairly dreary-looking tiny towns and agricultural areas. At last we were on the final stretch and I think the descriptive words that were going through our minds were ‘out in the middle of nowhere’. We were arriving the night before to see the cranes at sunrise and we had no idea where we would stay. Luckily when we finally got to the parking lot near sunset we found eight or ten other rv’s of various shapes and sizes in a rough circle and Jennifer, our excellent driver ably assisted by Judy on the walkie talkie, was able to parallel park the coach in between an old converted bus and a tear drop trailer attached to a SUV. Outside, the cranes’ calls were all around us. It was getting to be dusk and we walked over to the wetland and sure enough, there they were – many thousands or even tens of thousands birds I would guess. All night they serenaded us with their continuous musical calls. It was magical. I made this cell phone video more for the audio than for pictures. After dinner I went outside and made a images in the dark. It was quite lovely with the star-filled sky and a glow on the horizon from the closest small town. Even the glow of the surrounding RV’s was a little surreal. Early in the morning, I rolled out of bed and pulled on my big pack full of gear and went out to the dike that overlooked the wetlands. It was cold. Really cold. I had no idea I could be that close to Mexico with the temperature hovering around twenty degrees! Whitewater Draw is a former cattle ranch in the Chihuahuan Desert now owned by Arizona Game and Fish. From the information I could gather it is managed for wintering cranes and waterfowl and other wildlife. Not only were there many cranes but also lots and lots of waterfowl – Northern Pintails, Mallards, Green-winged and Cinnamon Teals, Gadwalls, Northern Shovelers and more. I saw one American Avocet and showed it to a birder from Alaska who was delighted to add it to his list. Jennifer brought me a cup of coffee to warm me up a bit and she pointed out a Great Egret. As I walked along the dike I saw a Loggerhead Shrike. There were lots of Wilson’s Snipes, Western Meadowlarks, White-crowned Sparrows and other common birds too. It was a delightful find in the desert of SE Arizona.